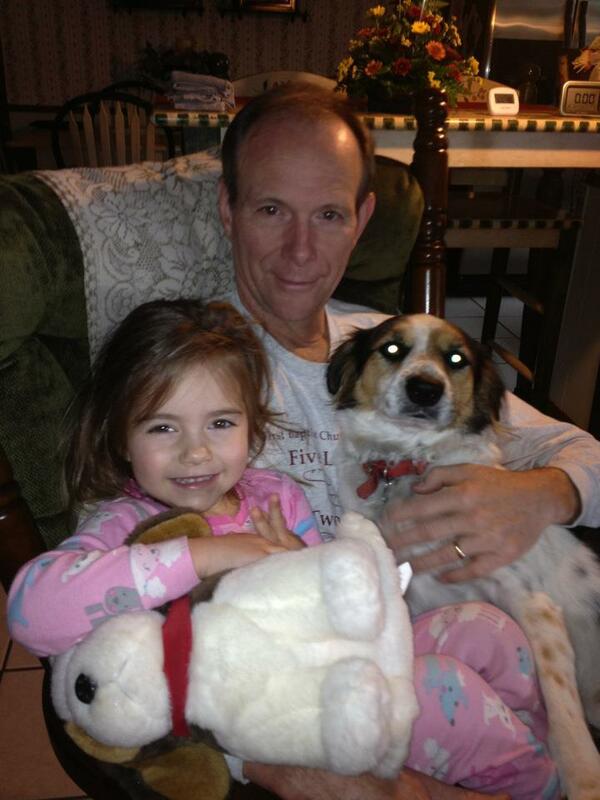 A few weeks ago, I was visited in my rocker by not one but two spoiled brats–Payton “Elizabuff” and Marley the dog. I believe Payton was the first one to climb up, but Marley is never outdone. He came by wagging his tail, looking winsomely at us in a manner of saying, “I want to get up there, too.” So, as usual, Marley got his way, and the photo tells all. Actually, I could make a case that three spoiled brats have climbed into Papa’s lap in that photo since the viewer observes Payton clutching one of her stuffed animal furry-friends. I can’t see the face well enough to be sure, but what parts of the countenance I can make out resemble Snoopy the Dog. So the dogs outnumber the little girl. She is just as happy, nonetheless. This will be the first Christmas for my brothers and sisters without our earthly father. My sister Janice wrote the memoir that follows, recalling our Daddy’s last Christmas a year ago at the nursing home in Bogalusa. A favorite Christmas memory! What a difficult task. I have been blessed with a wonderful family growing up with a loving mom and dad, three brothers and a sister. On many Christmas Eves we created Christmas “programs” to present to our parents. The older kids would have the “big parts” speaking or reading, and the younger kids given the “dress up-stand still” or singing parts. Our programs included everything from “Jingle Bells” to the Luke 2 reading to “Silent Night”. Presents were opened on Christmas morning – after Santa delivered them, of course! Our dad enjoyed his children at Christmas and was even more thrilled when we had families of our own and brought grandchildren home for Christmas. However, we always knew that no matter how much we shopped for that extra-special gift for Daddy, the wrapped gift often remained in its wrappings, unopened on Christmas morning. His joy was in watching everyone else open their gifts! We always got excited if he at least tore off the “end” of a package and peeked at the box or contents! After many Christmases filled with joy and celebration and family get togethers, Christmas, 2010, was going to be quite different. Daddy became a resident at Rest Haven in early November. Bob and I usually traveled to see our children and their families during the holidays. However, this year we remained in Bogalusa to be with my mom and visit Dad. Brothers, sister and our children either came to visit before Christmas Day or planned to come afterwards. Christmas Day would be Mama, Bob, and me visiting at Rest Haven. Since we’d be hanging out at Rest Haven most the day and there would be some workers there away from their families, Mama and I decided to make special holiday snacks for the nurses and aides on our hall! They were excited and appreciated our thoughtfulness. There was enough good food for them to snack on most the day while they were caring for our loved one and the loved ones of others. It felt good to share in this way. 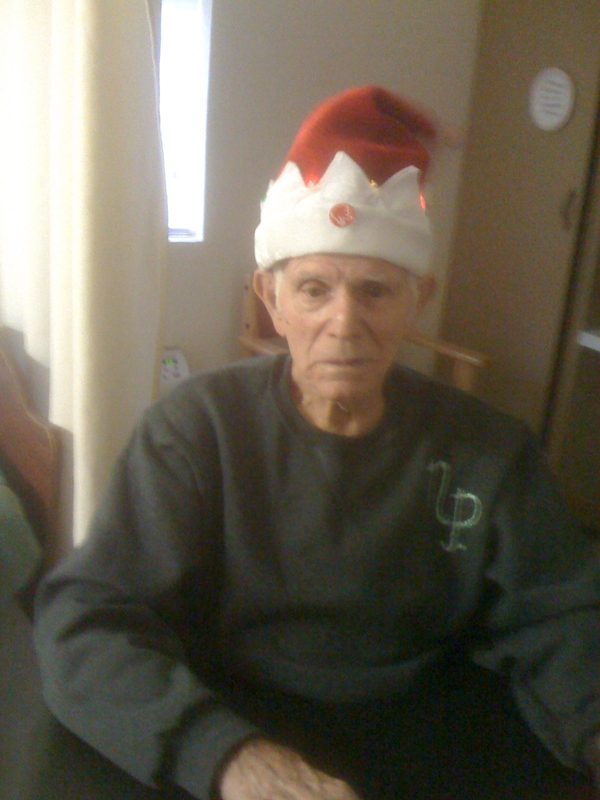 Daddy's last Christmas, a year ago. We did not know what to expect on this day from my dad. His Alzheimer’s kept him from showing emotions or understanding much that was going on around him. We gave him gifts, but were not that disappointed when there was little reaction. Across many years we had grown used to him not opening his gifts with excitement. As the day wore on, we kept the food and drinks stocked for the staff and shared Christmas joy as we could with other residents. Mid-afternoon my mom went home for a break. I was left alone with my dad. I talked to him and read the Christmas story from Luke 2, all the while wondering what was going on in his mind since I was getting no reactions. At one point I heard an aide singing down the hallway. I told Daddy, “Let’s sing some Christmas carols.” His blank stare said, “If you want. . .”! I started singing “Silent Night” and even though I was singing quietly, the aide outside the door heard me, stopped by, and helped me sing the complete verse. We finished singing, Daddy watched her as she left and I suggested to him, “Let’s sing another.” This time his eyes seemed to say, “Yes!”, so I started “Oh Come All Ye Faithful”. He began mumbling some sounds along with me. There were no distinct words but the melody was there. I was elated! After a verse of that song, I suggested we sing “Silent Night” again to see if he could have words or melody to that familiar carol, especially since he had just heard the aide and I singing that one. His eyes nodded agreement. About that time my brother in Texas called my cell phone. I answered and told him, “Listen and join in!” and began singing “Silent Night”. I didn’t want to lose that moment with my dad. I put the phone on speaker and held it up to my dad’s ears. There in that sparsely furnished room in a nursing home that we didn’t want to be in, the three of us sang “Silent Night” on that Christmas afternoon! There were a few phrases where I caught distinct words from my dad, but he fully sang the melody!! With tears in our eyes, my brother and I sang to the end of the song, sharing our joy through that brief experience with our dad on Christmas Day, 2010. My dad passed on to his heavenly home a month later on January 27, 2011. That experience will remain special and one of my favorite Christmas Days! The soft imagery of the season. I enjoy studying this picture I took last year. I had gone out on the patio in the cold, probably to get the dogs to do their business, and noticed through the French doors the Christmas tree inside standing by the cozy hearth, the tree bristling with hundreds of tiny lights as the fire leapt among logs sacrificed to warm the house, the mantle dressed with stockings and lace. I went back in for the camera and snapped this image–I really didn’t realize at the time what I was preserving, but now I do. Merry Christmas from the Pullings on Hill Street: T’is the blessed season! I looked in my portfolio to see when I had written the following tribute to Grandma after her passing in December 2005 at the ripe old age of 100. The date on the piece was December 13, 2005, 6 years ago. I have been thinking about her lately, knowing this anniversary was coming up. 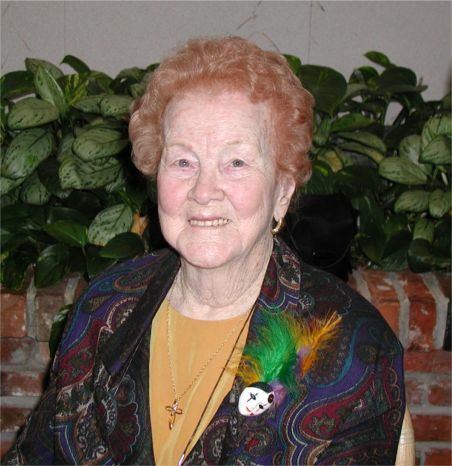 I offer these respects again–years later–in loving memory of a family treasure. We could reason, I suppose, that Granny’s passing makes her at least indirectly a Katrina casualty. As I consider that possibility, I believe that her hurricane saga will add a rich chapter to the family lore–our kids and their kids will recount to family generations the story of their 100 year-old great granny’s escape from the nursing home as the flood waters rose, her flight and sojourn to what must have seemed to those old city folks a strange and exotic land in North Louisiana, but where through the provision of grace (an example of miraculous “signs and wonders”) she made the trip fine and landed right down the road from Uncle Fred and Aunt Marion. The question could arise as to whether that 3-month interlude is what finally cashed her in physically, but since the arrangements worked out so miraculously as they did, and since she seemed to do so well up there until right before the end, maybe it’s better to reason that God granted those final months to her just so we would have Granny’s Katrina legacy as one more reminder of the Lord’s provision, Granny’s final witness to us of how grace enables us to weather the storms of life. And so ends another chapter–this one happily for a Saint gone home–in the soul-numbing epic of the great Gulf Coast hurricanes of 2005. Lord, grant us grace, as you did Granny, to weather the storms to come! 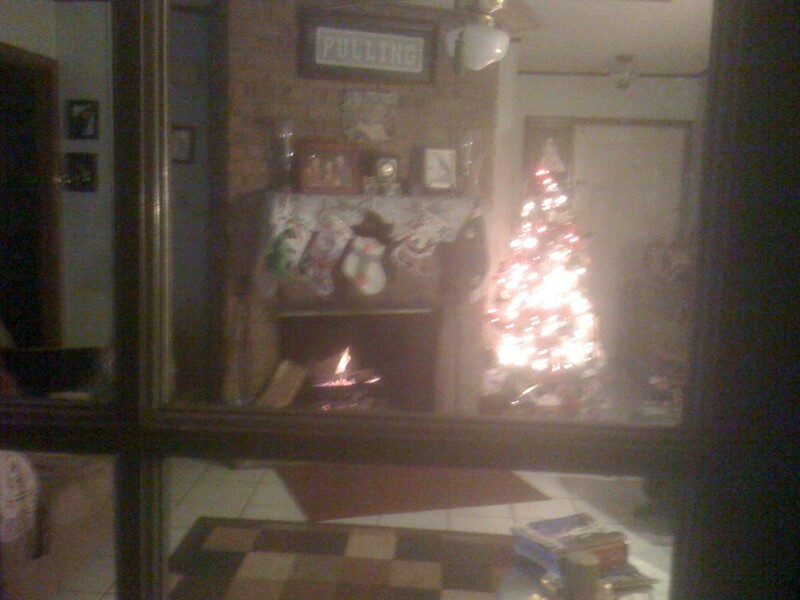 I spent the night in Alexandria, Louisiana, several years ago in the early Christmas season in a hotel downtown. After dark, I walked out on the levee to see the Red River at night. Across the distant shore on the Pineville side, Christmas lights spelled out “Peace on Earth.” The lights reflected upside down on the water. “Hmph,” I thought, “What a metaphor?” Anyway, I thought about it and dashed out the following. Today more appropriate than then? Or do we long more for peace more now than then because we’re tired of its noisy, strife-ridden antithesis? “Oh, hush the noise, ye men of strife / And hear the angels sing! on the dark, moon-dappled River.